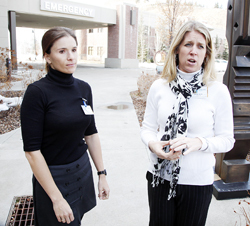 Tanya Keim, right, spokeswoman for St. Luke’s Wood River Medical Center, discusses security procedures put in place Wednesday and Thursday at the hospital because of a possible threat against the mother of an infant child at the facility. At left is Jenny Haynes, the hospital’s marketing and public relations coordinator. Whither those friendly (and cheap) skies?